Since 1980, Tiziano Faccia has managed to do just that, by creating and patenting the first ever cylindrical vertical mixer equipped with a conical vertical screw with a wide base that narrows towards the top. Today, as they see this type of machine, workers in the field immediately understand that it is a mixer, but this was not always the case. The unprecedented shape of the vertical mixer was ridiculed, before being appreciated for its efficiency and practicality. The evolution of this product is due both to the tenaciousness and pure genius of the man who invented it. He worked for many years in close contact with his first clients, who cleverly and immediately realised the quality and potential of this machine. By interpreting their requirements, in 1984, he made and patented innovative changes to the previous model, thereby increasing yet further the extraordinary performance. This machine was the first that allowed you to introduce any type of product whatsoever into the mixing tub: long fibrous materials, whole large square or cylindrical bales – all this would previously have been absolutely impossible in any of the other mixers available, and yet now, is all possible whilst retaining a natural mixing of the products, without altering their organoleptic properties. Hence the machine's success. Machines are not all equal, even if plagiarised. We guarantee the original, and our products have been designed and developed in order to guarantee all the necessary features to meet the demands of the various world markets. Some patents relating to our most important inventions. Patent and construction of the world's first vertical mixer. Patenting of the first conical 1 or 2 synchronised screw vert ical mixer equipped with knives and counter-knives. First vertical mixer with front or rear discharge. 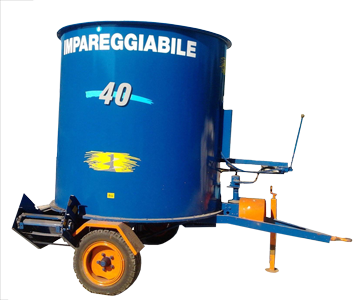 Patent and construction of the first self-propelled vertical mixer with hydrostatic transmission and high pressure pumps. Patent and construction of the first vertical mixer with 2 or more screws positioned on different levels..